Last week I mentioned that my husband had some reward points to redeem with Wells Fargo, which is basically bonus money. Now I wanted to mention another way you can convert what you have around the house and in your car for building your savings – coin counting. Yep, the coin jar you may have started at your grandparents’ house can be a nice little cash boost. The great thing about having coin jars (my husband and I have one each and our baby girl has one in her room). my system is pretty simple. Whenever I get change during the day I save the change in my wallet until I get home and then I deposit half in my jar and half in my baby girl’s jar. Any pennies or coins I find get deposited into the baby’s girl’s jar. It’s not much each time, but it does add up fair quickly. typically when my small jar is filled it can be $50-$70 at a time. One of the most cost effective ways to convert your coins to dollars is to go to your bank’s local branch. However not all banks offer it a machine to count your loose change. Please call ahead before taking your loose change to the branch to make sure you can use their service and it’s free. Some banks like Wells Fargo, Bank of the America, and Citibank require you to roll your own coins before you can deposit them with a teller. When I asked the teller at the branch near my house she helpfully gave me some coin wraps to take home. The big plus with depositing your coins is that you can then build your savings or you can use that money for other goals like paying down debts, investing more, or taking a debt free vacation. Coinstar – A Good Deal? Maybe your bank doesn’t offer loose coin counting services. If so then there are other options that may be as close as your grocery store – Coinstar. You can redeem your coins for cash, load it on their Green Dot debit card, or your can use one of their no fee options – gift certificates with selected vendors. If you go the cash route, there is a fee – 9.8 cents per dollar counted in USA and 11.9 cents per dollar counted in Canada. If you fill (or refill) the debit card or get a gift certificate, it’s free. 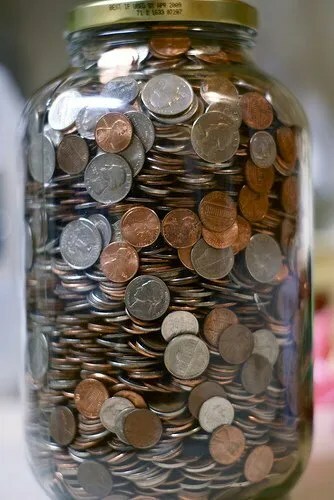 How many of you have coin jars at home? What do you do with the saved money? Do you take your money to the bank or do you use services like Coinstar to get your money converted? We’re pretty much cashless, so getting coins is an annoyance, but a rare occurrence. The other day I redeemed my Costco American Express reward certificate, and the only option was to buy ~$400 worth of stuff, or get cash from one of the checkout cashiers (I believe other Costco stores can write you a check). So now I have a handful of coins that will sit around forever. Come to think of it, I can pass the pain on to someone else – by dropping it in the tip jar at Starbucks! I’m sure they’d appreciate some extra money! We’re pretty much cashless except for using cash for lunches out. I also get some cash as I carpool with friends and they sometimes want to help out with gas. I figure savings these coins can be helpful if I put them to use for one of our money goals. That’s awesome MB! That reminds me of my uncle, he patiently saved his coins too. My uncle had quite a collection of coins for his kids (used the 5 gallon water jugs). We have a coin bin but regularly raid it for silver coins to buy 69 cent sodas or slurpees. It is a fun way to enjoy our spare change. We used to spend our small change, but save our toonies and loonies. We purchased our first digital camera with nothing but toonies and loonies. Nowadays though we use credit card 99% of the time, and the rare cash payment – when credit/debit isn’t accepted. Congrats on the digital camera buy! My family has over $100 in the coin jar at the moment. We work the same way you do; whenever we have change, it goes into the coin jar when we get home. Whenever we cash in, it goes into a vacation fund. Great job on the $100! Having a little extra spending cash on vacations can be a lot of fun. In December, I go to the Coinstar machine and buy gift cards for my 5 (adult) kids. Thanks, that’s a good idea for those trying to stay out of debt when giving gifts. I work next to a credit union with free coin collection- every Friday change from lunch for the week goes directly to the emergency fund. Pretty painless.